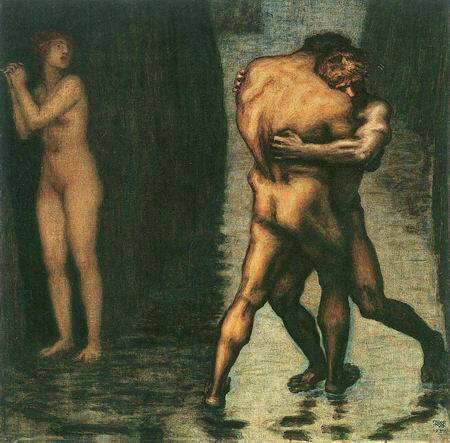 Franz von Stuck did not begin as a painter, but as a graphic designer and an architect. Born in Bavaria in 1863, Stuck showed an early talent for drawing and caricature. He attended the Munich Academy from 1881 to 1885 where he refined his artistic style. Stuck first became relatively well-known when he began illustrating cartoons for the German weekly satirical magazine, Fliegende Blätter, a publication with 95,000 copies at its peak circulation, and featured other artists such as Wilhelm Busch and Julius Klinger. Stuck supplemented his magazine work with providing drawings for book covers, pamphlets and promotional posters. Here Stuck begins exploring the creation of icons and the legendary, biblical and mythical symbols that will later dominate his painting career. 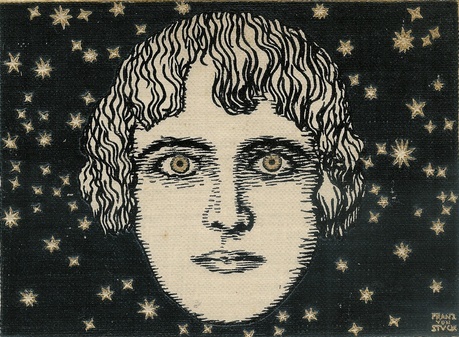 Illustrated cover of a Weltgeschichte (world history) book – the figure’s eyes and the stars feature gold embossing. In 1889, Stuck debuted his first painting at the Munich Glass Museum, and had his American art debut at the 1893 World’s Columbian Expo in Chicago. The themes featured in his paintings addressed many of the modern issues of the time as expressed by Darwin, Freud and Friedrich Nietzsche. In 1872, Nietzsche published The Birth of Tragedy, which explores the warring and complimentary sides of artistic impulse. Apollo is the god of the sun, reason and logic, while Dionysus is the god of wine, ecstasy and intoxication. Combined, the two opposites create “true” tragedy, something that hasn’t been formed since the Greeks. 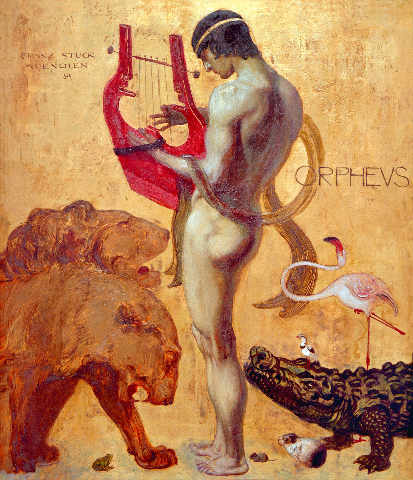 Stuck’s painting Orpheus is a perfect example of the clash of these two ideals: Orpheus was a legendary poet, musician and prophet in ancient Greek myth, and could charm even the stones with the music from his lyre. Orpheus climbed Mount Pangaion to worship Apollo at sunrise, but was torn to shreds by maenads, female followers of Dionysus, for refusing to renounce Apollo. Stuck believed that this delicate balance between reason and emotion is what makes art that speaks to the human soul. Stuck was fascinated with Darwin’s idea of man evolving out of beast, but still retaining primal instincts and animal urges. 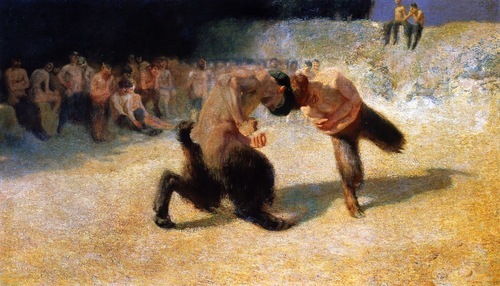 Many of his paintings feature duels between humans or part-humans such as fauns and centaurs – humans literally growing from animals. These images of physical grappling are either for the prize of a female as an example of sexual selection of the strong, or a fight to the death and survival of the fittest. Stuck used mythology and religious iconography to recast the female role in his art contrary to society’s ideas at the time. He renders many Biblical stories where the woman holds the power, either through seduction or warfare. Stuck paints the story of Judith, a beautiful widow who uses her feminine power to seduce Holofernes, an Assyrian general who intends to ruin her town. 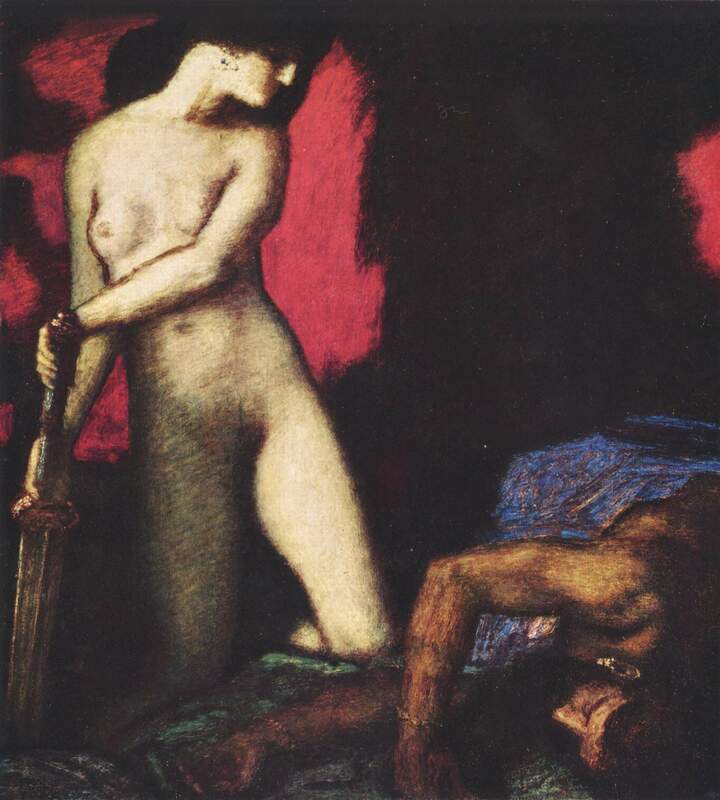 Once inside his tent, Judith drugs him and beheads him. Of the more than 100 artistic versions of this story, most feature a beautiful woman holding a severed head – demure, virtuous and victorious. Stuck, however, captures the figures in the moment before the act: Holofernes is unconscious while Judith draws his own sword against him – poised to kill, with the fate of many in her hands. 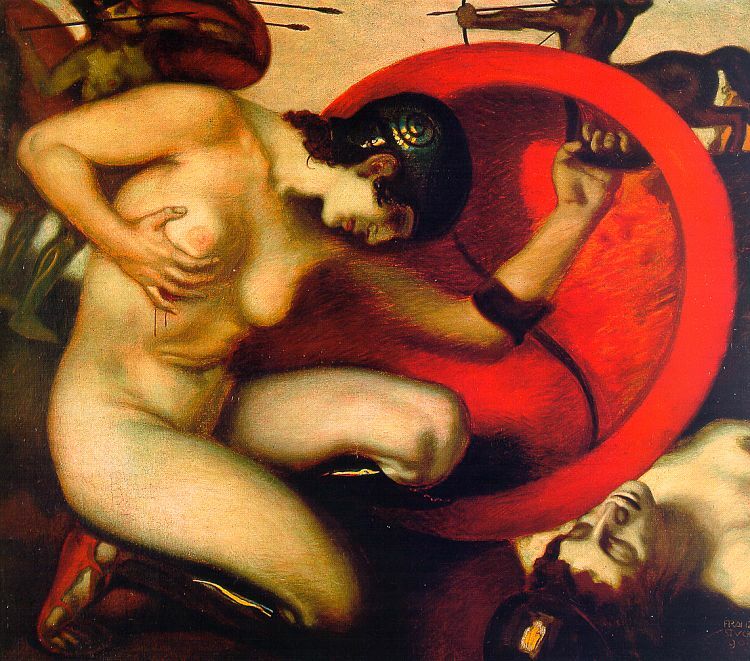 Other female renderings show an Amazonian woman wounded in battle against centaurs or Athena, the goddess of courage, justice, strength and warfare (traditionally masculine traits). 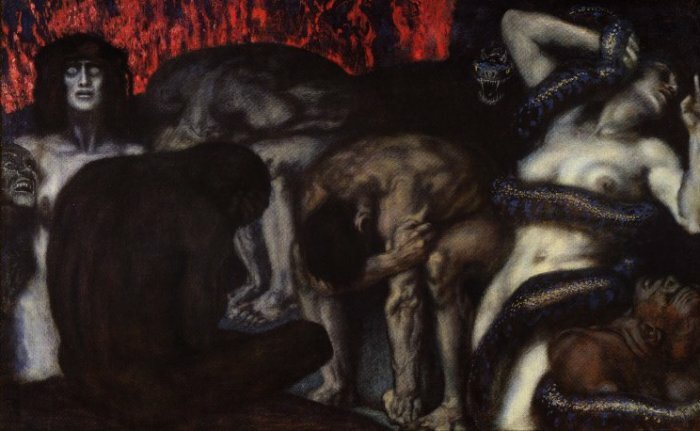 In addition to Greek mythological creatures, Stuck was fascinated with capturing human tangible emotions (such as anguish) in Biblical imagery. Many of his paintings are titled simply, and feature striking depictions that leap out at the viewer. Stuck also designed a villa estate and artist studio, built in 1898 in Munich, which became the municipal Museum Villa Stuck in 1992. Many of the museums dedicated to one artist at the time were designed by people who had studied under them. Villa Stuck was unusual because it was originally built as a home and studio for the artist, by the artist – everything from the estate grounds to the tiniest detail of the building’s interior was designed by Stuck, even the sculptures around the house. The Frye exhibit features a geometric gold pattern near the ceiling that was created by Stuck and repeated extensively around the villa, as well as a fabric swatch of striped flower design used to upholster many of the chairs. People attending the Franz von Stuck art exhibit opening at the Frye Art Museum on November 2nd included Jo-Ann Birnie Danzker, director of the Frye and curator of this exhibit; Dr. Irina Moutafchieva, director of the National Gallery for Foreign Art in Sofia, Bulgaria; and Michael Buhrs, director of the Museum Villa Stuck in Munich, Germany. 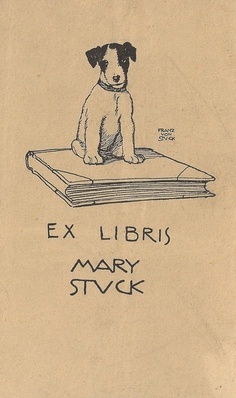 There was also a private collector who brought an original Stuck book plate illustration. Seattle artists Isaac Layman and Ginny Ruffner also attended the opening. 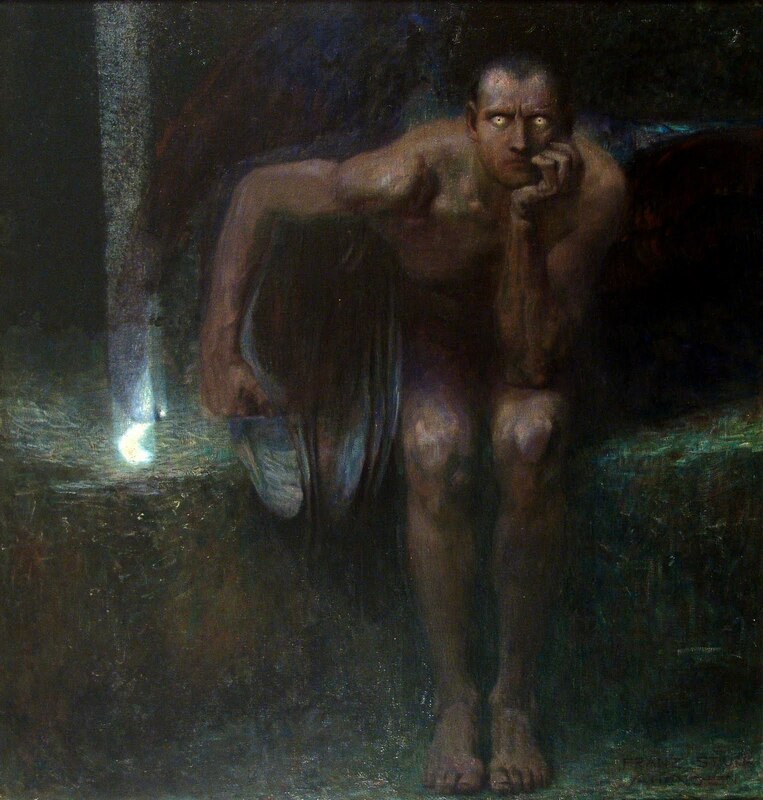 The Franz von Stuck exhibit will be on display through February 2, 2014, and the Frye Art Museum is always free to visitors. This entry was posted in Music and Art, Photo Gallery, Reviews, The Seattle Scene and tagged architecture, buildings and structures, Charles Darwin, Friedrich Nietzsche, Frye Art Museum, Germany, Ginny Ruffner, graphic design, history, Isaac Layman, Munich, Museum Villa Stuck, mythology, National Gallery of Foreign Art, Sigmund Freud. Bookmark the permalink. 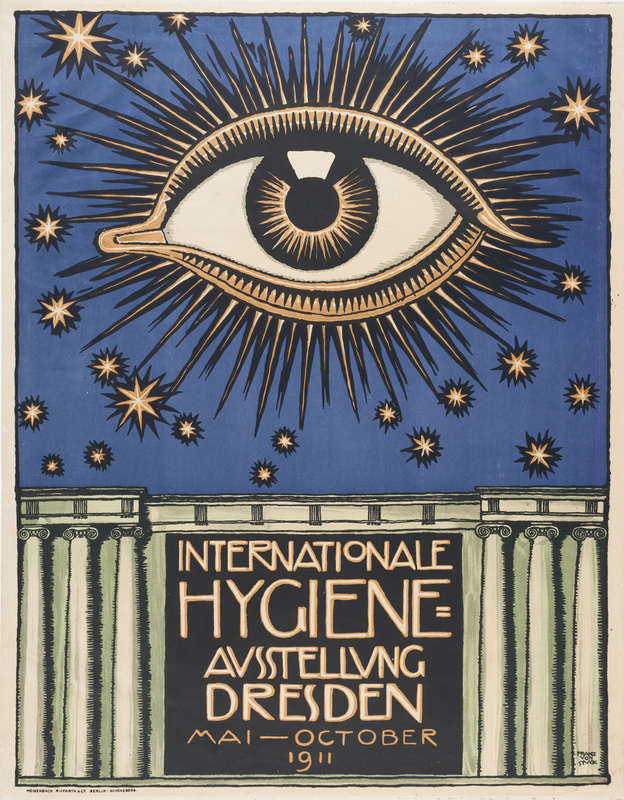 Great review – loved reading about the exhibition I sadly won’t get to see. Many thanks.